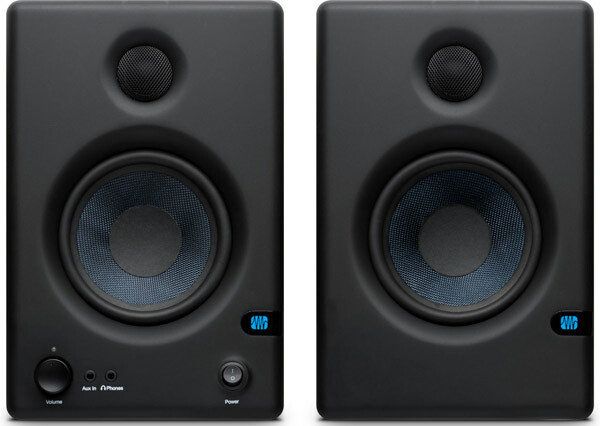 Presonus Eris E4.5 - ( Pair ) 2-way active studio monitors give you a high-quality, high-value alternative to "computer" speakers. Eris employs a Kevlar woofer, a low-mass silk-dome tweeter, Class AB amplification, and professional acoustic-adjustment controls to deliver true studio-monitor accuracy, at a price point that's flooded with ho-hum "multimedia" speakers. And unlike comparably priced studio monitors, Eris gives you controls for flattening frequency response to facilitate accurate mixing. Need accurate monitors but don't want to break the bank? You should give the PreSonus Eris E4.5 a serious audition. PreSonus: gear designed by musicians, for musicians - The brainchild of current Chief Strategy Officer Jim Odom - a musician, producer, and LSU graduate in electrical engineering, and co-founder Brian Smith (VP of Engineering), a fellow LSU engineering graduate, PreSonus was launched in 1995 with the mission of building affordable, professional music-production tools for musicians and audio engineers. Based in Baton Rouge, Louisiana, PreSonus in 2014 moved into its new digs, complete with a professional recording studio and live-sound venue designed by the world-famous Walters-Storyk Design Group.